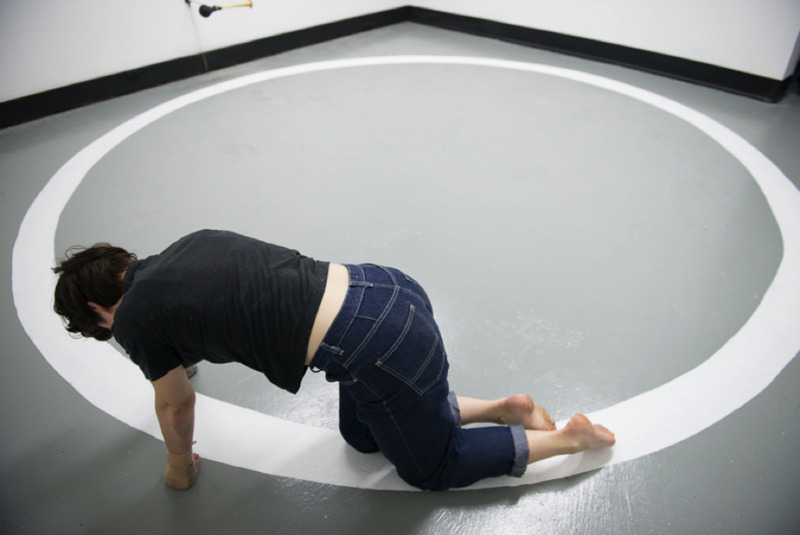 In The 12-Hour Revolution, Frances Barrett endured a repetition of the same act: crawling on her hands and knees in a circle on the floor of the Sydney Guild gallery space. Throughout the duration of the performance, her pace varied based on her levels of enthusiasm and fatigue. As each circle was completed, she would pass a clown’s horn installed at her level and she would reach for it to honk. The sound of the horn was recorded and relayed on the hour, every hour, from the time the sound was made to the end of the 12-hour period. Read more about this work on Frances Barrett's website. Frances Barrett is a Sydney-based artist whose practice includes both individual and collaborative projects. She is a founding member of performance and video collective Brown Council , who in 2014 will be presenting projects at Gallery of Modern Art (Brisbane) and Museum of Contemporary Art (Sydney). Between 2009-2013 she was Co-Director of Serial Space, who in 2012 curated and produced Time Machine, a festival of experimental time-based art. In 2013 Frances undertook an Australia Council for the Arts studio residency in Liverpool (UK) and presented two new works: The 12-Hour Revolution at The Sydney Guild and Box Set (in collaboration with Kate Blackmore) as part of Emma Ramsay and Alex White’s curatorial project Tele Visions at Performance Space. In 2014 Frances will be presenting new work as part of Day For Night at Performance Space (Sydney), SafARI (Sydney), and Restaging Restaging at Alaska (Sydney). Barrett's website can be found here.